Well, leg 3 of the 2009 Another Lost Shark tour was a huge success. I had never been to WA but know for sure that I will return many times. 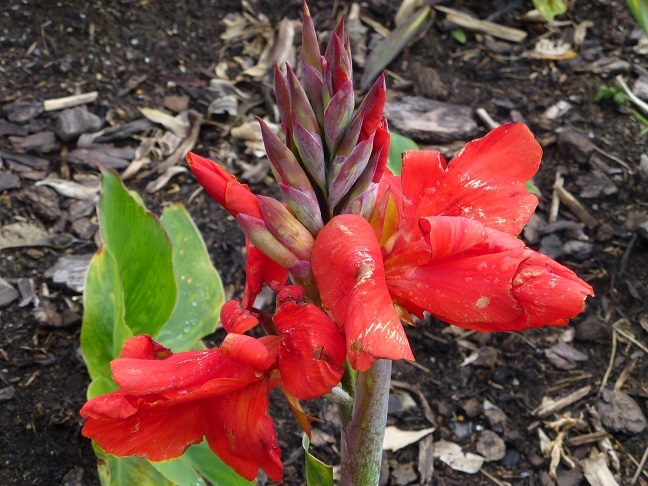 I met so many incredible people, and have made connections that I know will be lasting, and the place itself had a huge impact on me… Perth’s green space – Kings Park, Riverside Drive – is some of the best I have ever witnessed. Thanks to Holly & Mick for looking after me and showing me around. After touching down at midnight on Thursday, it was only a few hours until I was up and moving… and from then on, I remained in perpetual motion. Friday started with a day long haiku workshop – from joy to grief in one breath. The group that gathered (including respected haiku poet, Maureen Sexton), were an inspirational bunch and were completely open to the haiku journey… We talked about the history of haiku, some definitions (if there can even be such a thing), the fragment and phrase theory, wabi and sabi, guidelines for writing and revising work, eight techniques for writing and asked the question – are the syllables important? 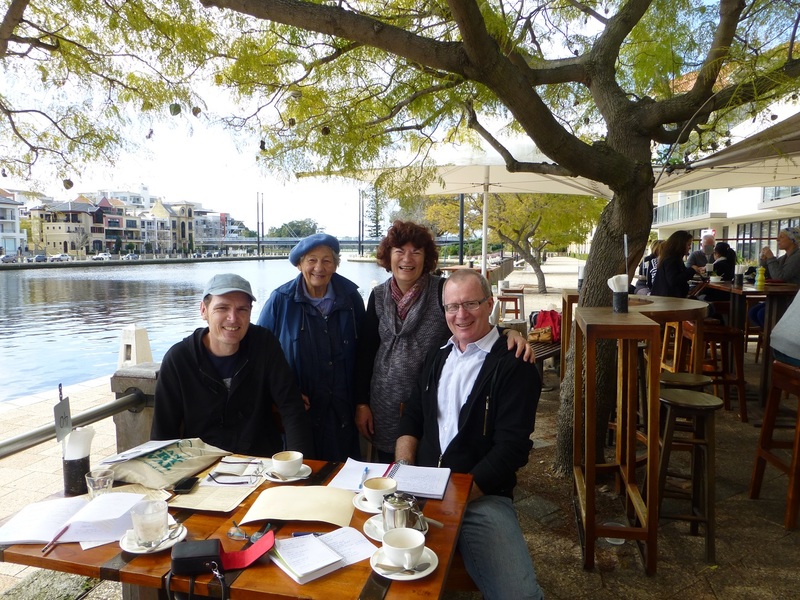 We also went on a ginko around the Perth cultural precinct and then came back and workshopped many of the haiku composed. Haiku were shared and the conversation was vigorous. The perfect way to begin the weekend. So with the festival launched, we headed over to Sunyata Buddhist Centre, for the first reading of the festival. I have to pause here to add that this venue, is the most inviting space I have ever read poetry in. The energy in the room, so welcoming, so inclusive. A truly, unique room. The first reading, MC’d by Sue Clennell featured the lyrically elegant Annamaria Weldon (check out her book, The Roof Milkers, it is superb! ), two times Tom Collins Poetry Prize winner Peter Bibby, the spontaneous narratives of Amber Fresh (you must also check out her book, Between You And Me) and this Lost Shark. The open section was also buzzing. It was so good to be immersed in the words of local poets. I went home that night, head swimming, anticipating Day 2. Saturday featured a number of panel discussions the first Poetry and the Environment and the afternoon panel – Cultural Diversity, which I was honoured to be a part of alongside Peter Bibby, founding editor of Magabala Books, the immensely talented Afeif Ismail Abdelrazig, and Glen Phillips. I talked about my experiences in Ubud in 2004 running haiku workshops and performing with a gamelan band as well as my regular trips to Blackall (Western QLD) and the lasting impact the land has had on me and my work. Listening to Afeif talk about his experience as a refugee living in Australia and the time he spent as a political prisoner was both humbling and deeply insightful. Truly people, you have to read this man’s work. I also got to read at the mighty Perth Poetry Club, run by Janet Jackson and a small but devoted team. Janet has enough energy to power a small village. Check out some of her work here. Saturday night, we returned to Sunyata for a multi-cultural poetry reading MC’d by the delightful Vivienne Glance. This was the highlight of the whole festival… words can’t begin to capture the intense emotion in the room, the coming together of cultures, poets, humanity. Performers included Nick Di Lello, Istenad Haddad, Tam Thai, Lily Chan, Afeif Ismail Abdelrazig and the WAZA ensemble (playing traditional music from Sudan). Maureen Sexton and I were also invited to read haiku, so we joined forces and combined our reading, which confirmed my belief, that if you put two poems side by side (or in the air together), they will be drawn into dialogue. I then closed the reading with a selection of haibun from Measuring the Depth and my long poem Beyond, from the Black Stump Blues series. This night, is etched in my DNA. And then it was Sunday. The panel on publication saw some really interesting discussions emerge, with topics ranging from self-publishing to traditional publishing to digital publishing to performance to journals and onward. The second panel for the afternoon, Poetry Into the Future chaired by the incomparable Jeremy Balius was another highlight for me. I shared the panel with Scott-Patrick Mitchell, Amber Fresh and Amanda Joy. The energy between us, electric. A real sense of coming together. We each shared our stories and Jeremy shot questions at us to keep it all flowing. And again, the topics covered were diverse. We talked about success, we talked about influences, we talked about innovation and most importantly… we read poems! Then, it was trip to Fremantle… seriously, if you have never been there, do yourself a favour. I got the opportunity to have a wander through the streets and the one second hand bookstore I stumbled across was incredible. The fish & chips on the water was pretty damn good as well. And before I knew it, I was at Fringe Gallery, for the closing night readings. This is another space I am forever thankful for being invited into. There was open mic, there were features from Annamaria Weldon, Peter Bibby, Amber Fresh and I was thrilled to be able to hear Amanda Joy read from her recent chapbook (and even more thrilled to have received the last copy), Not Enough To Fold (Verve Bath Press). I have long enjoyed Amanda’s work and after hearing it, I have an even greater appreciation. I closed the night with a set of predominantly new poems… and they felt good. The room was smiling back at me and the weekend of memories flooded back. 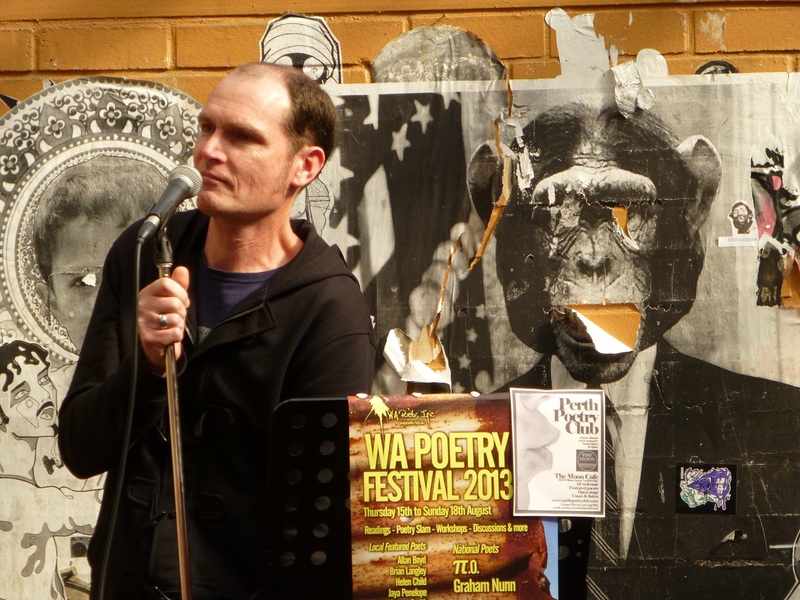 Chief organiser of WA Spring Poetry Festival Peter Jeffery’s words of thank you are still resonating. So again, thank you Peter for the incredible opportunity. My first visit to Perth… well, the people and place are now in my blood. Back on the east coast… it doesn’t seem so far away.